Trucks are bigger than ever these days, but this pickup stands out in the crowded market of offerings – even in Texas, where everything is bigger! The updated 2017 Ram Power Wagon Crew Cab cuts a swath that is unique in the realm of off-road toughness. 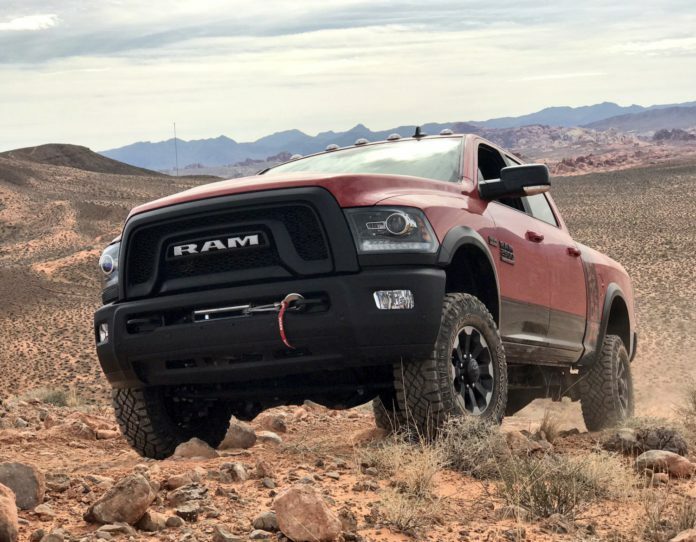 Ram’s Power Wagon started life in the battlefields of World War II in as America’s first 4 x 4 pickup, and has evolved into one of the world’s most talented production trucks. It has a tall ride-height, extreme 4WD capability, and confident carriage. This truck a ‘top dog’ designed for work and forays, into the lands where the pavement ends. 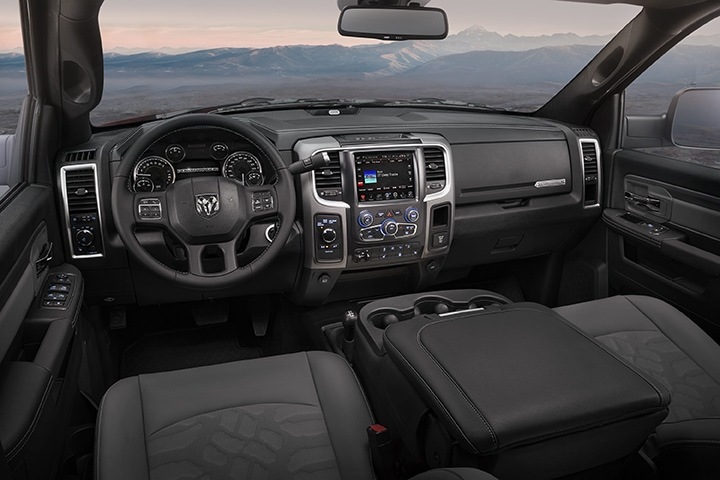 The upgraded pickup sits on the Ram 2500 heavy duty 4×4 platform, and incorporates the best of Ram trucks’ toughness, and competence, along with an impressive collection of convenience and comfort features. It then adds an extra dose of extreme hard-core capability for the back-country that enables the Power Wagon to make short work of a wide variety of off-road challenges and still run the highway like a premium SUV. Its inimitable design, well-engineered power-train and robust specs blend to make the factory-built heavy truly distinctive, with styling cues and graphics that give it a bold and exclusive appearance. New for 2017 is an all-new larger blacked out grille with a prominent Billet Silver “RAM” badge. Flanking the grille are Black bezel bi-functional projector headlamps, with LED marker lights. A vent-stamped bulging hood features a Gloss Black graphic and blacked-out theme which continues around the truck incorporated into its bumpers, lower body panels, wheel-arch moldings, mirrors and badging. A new body graphic located behind the cab takes its cue from 1979-80 “Macho Power Wagon”, with a thick vertical stripe that enunciates “Power Wagon” in a large, rotated font. The rear is distinguished by a distinctive 324-point original font “RAM” stamped tailgate in blacked-out lettering, with a black “Power Wagon” decal across the bottom of the tailgate. The pickup runs on newly designed 17-inch forged, multi-surface aluminum wheels with Silver outer and Matte black inner highlighting; they feature exposed lug nuts and a small center cap. Standard are 33-inch Goodyear Wrangler Duratec LT285/70R17D OWL All-terrain tires – designed to optimize performance off-road and on the highway. A full–size spare tire is standard. Inside upgrades include technical grain seats finished in Diesel Gray with Black and Sedoso fabric inserts, embossed with the Goodyear Wrangler DuraTrac tire tread pattern. The truck’s seats and cabin surrounds feature Light Slate Grey accent stitching. Front seating gets Ram logos on the headrests, with a Black and Light Diesel Gray “Power Wagon” nameplates on the seat bolsters. Standard are black wheel flares, a 6 ft., 4-inch cargo box; 40/20/40 split front bench seating and a 60/40 split bench rear with fold flat floor; automatic premium projector lamps, fog lamps, LED tail lamps; variable intermittent wipers; mini-floor console; carpeting with front and rear rubber floor mats; rear underseat storage and in-floor stowage boxes; and a rear power-sliding window. Other features include Uconnect 5.0 connectivity with 6-speaker audio, tire pressure monitoring and remote keyless entry. The safety suite includes an Electronic Brake Controller, Hill-start Assist, Electronic Roll Mitigation, Brake Assist and All-speed Traction Control with Trailer-Sway Control. The 2017 Ram Power Wagon 4×4 Crew Cab’s MSRP is $51,695 plus $1,320 destination charge. An available Leather and Luxury Package ($4,495) adds a leather-appointed interior, Uconnect 8.4 and 9-Alpine Speakers with Sub-woofer, Dual-zone temperature control, high-back heated and ventilated front seating, ParkSense Front and Rear Parking System, ParkView Rear Backup Camera. Under the hood is a powerful 6.4L HEMI V8 that kicks out 410 horsepower at 5,600 rpm with peak torque of 429 lb.-ft. at 4,000 rpm. A Fuel Saver cylinder deactivation system improves fuel economy while unique engine tuning enhances off-road performance by adjusting the throttle; in 4LOW off-road gearing, for instance, increased rpms bring additional power and control for hill descent and/or crawl modes. A six-speed automatic transmission is integrated with a part-time, manual engagement Borg-Warner 44-47 transfer case. Power is transferred through hefty axles (9.25-inches front and 11.5-inches rear) with 4.10.1 ring and pinion ratio. Rear axle shafts are upgraded to 38mm and both axles have Tru-Lok electronic locking differentials. Of note, the truck has a segment-exclusive front axle disconnect system that automatically decouples the front drive-train components when appropriate such as for highway travel, to improve fuel efficiency. 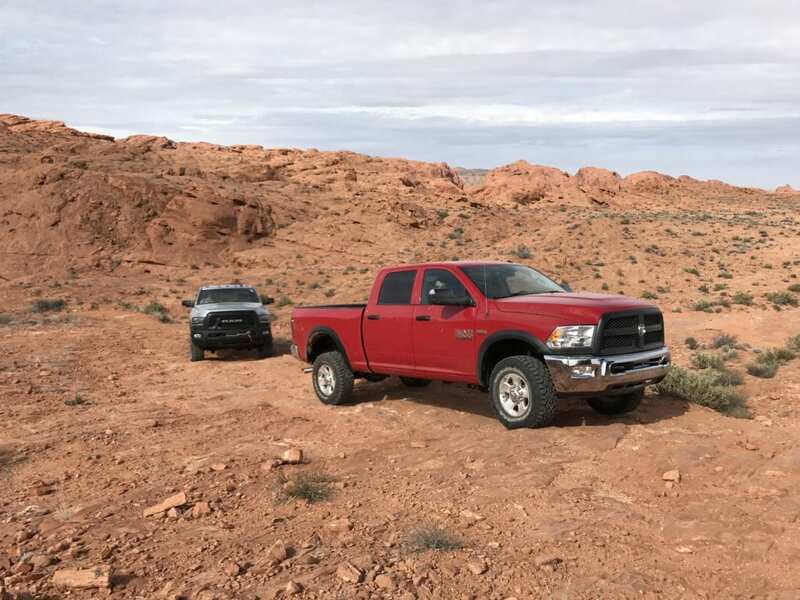 We drove the new Power Wagon on roadways in New England and also out of the bustling cityscape of Las Vegas to an off-road track, where we tested its backcountry capability. It scored high marks in all of our evaluation. Its hydroformed steel frame brings stiffness on pavement and dirt, while its front suspension ensures good ride height and a smooth ride. Bilstein shocks, modified control arms and an additional two-inches of lift provide good articulation over rocks and uneven terrain. 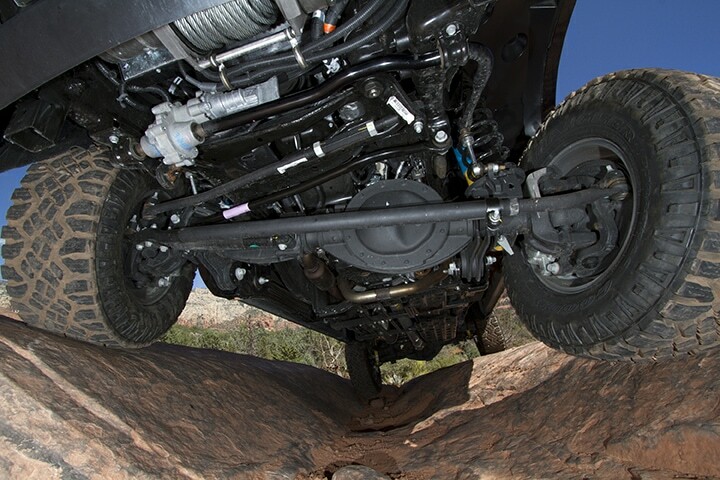 The class-exclusive electronic disconnecting sway bar allows the front axle to move more independently of the truck’s frame; this “Smart Bar” is driver actuated in either 4HIGH or 4LOW below 18 mph for added flex and automatically reengages at speeds above. In back, an all-new segment-exclusive five-link coil rear suspension system with Bilstein monotube shocks and a Bilstein dampener improves frame articulation and axle control over obstacles. Fast Facts: 2017 Ram Power Wagon has 1,500 lbs. of haul capacity and can tow 10,030 lbs. ; benefits from an approach angle of 33.6 degrees, 26.2 degrees departure and 23.5 degrees of breakover; 14.3-inches of ground clearance; 30-in. of water-fording depth; skid plates under the engine, transfer case and fuel tank; and standard tow hooks and a segment-exclusive WARN 12,000 pound power winch integrated into the front bumper.